The race is on to win the coveted Shed of the Year competition which will be held this summer as part of the first ever National Shed Week. Organised by the internationally-famous readersheds.co.uk in collaboration with The Shed magazine, National Shed Week (which runs from July 2 until July 9) will be the first national celebration of one of the cornerstones of British culture. 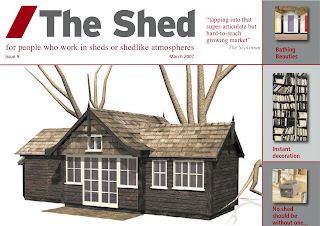 "Every shed is unique," says Uncle Wilco (Head sheddie) from readersheds.co.uk. 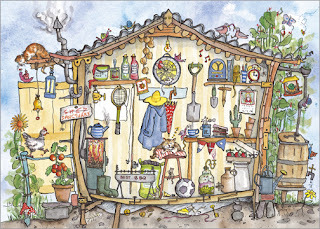 "The traditional shed found on allotments and in back gardens has been a second home to generations of men and women. 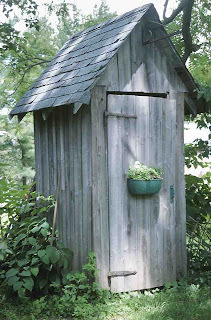 But the 21st century shed comes in many shapes and sizes and serves many purposes. 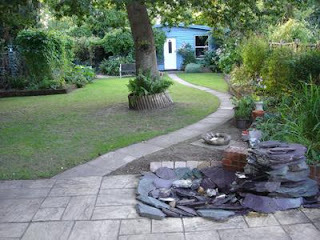 There are pub sheds, shacks, studios, and even Tardises not to mention increasing numbers of garden office sheds catering to the increasing demand for working from home. As a place for a little slice of freedom and a spot to indulge yourself, there's simply nothing that can touch it." Details of the various activities in National Shed Week will be announced in coming months - with a high quality shed from Taylors Garden Buildings among the top prizes - but star billing goes to the prestigious Shed of the Year competition. So here's a call to all existing sheddies and any new ones that they should register their shed on www.shedoftheyear.co.uk by June 25 2007. The public and fellow sheddies will then be able to vote in a range of shed categories (including Garden Office of the Year which is sponsored by The Shed magazine) and prizes will be awarded to the best sheds in the each category, The group winners and overall winner will be announced during National Shed Week. News updates will be posted at www.shedweek.co.uk and at this blog. Homeworkers in the UK should thank their lucky stars they're only taxed on their income once. Nicole Belson Goluboff writing in Legal News TV reports on the latest update on the dreaded 'telecommuter tax'. In a nutshell this means that a Connecticut resident who is an editor with a Manhattan publishing company and works mostly from home would find that under the “convenience of the employer” rule, New York may tax him, not only on the income he earns when he is physically in New York, but also on the income he earns when he works in Connecticut. Because Connecticut can tax him on the income he earns in Connecticut, he may be taxed twice on his Connecticut income. That doesn't strike me as a great incentive to work from home. Goluboff writes: "Under New York’s rule, a nonresident telecommuter may avoid New York tax liability on his out-of-state income if telecommuting is an employer necessity. But New York has almost never considered telework necessary. Until 2006, to prove necessity, a telecommuter had to show that his work, by its nature, was impossible to do in a New York office – say, photographing horses. Since most of the work employees can do from their out-of-state homes is work that can also be done in a New York office, the test was easy to fail." There's obviously a fight to get this law amended which is outlined clearly in the article. Well, it's not quite that, but in the US of A it's Take Our Daughters and Sons to Work Day. Except that of course not everybody goes very far to work nowadays. Among them is Lori Sokol writing in the Baltimore Sun who says the 'typical' experience of work is now atypical thanks to homeworking and that this needs to be reflected in this traditional day: "We should teach our children not only how teleworking can be done, but also why it must be done." The Swedish-based Arvesund has a lovely shed which they market as a Hermit's Cabin. Designed by Mats Theselius, it's aimed at one person use, measuring around eight square meters and covered inside and out with wood from old North Sweden barns. Those of you interested in Heidegger's Hut will be interested in some of the more philosophical writing on the site. 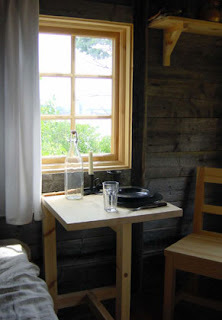 “Most people probably associate the term Hermit’s Cabin with religion and monks” says Theselius. 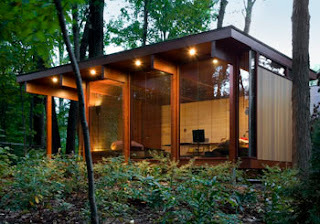 “But this cabin is rather a way of channelling the city dweller’s lack of seclusion and proximity to nature. I wanted to show people’s longing to escape from the intensity of urban life. 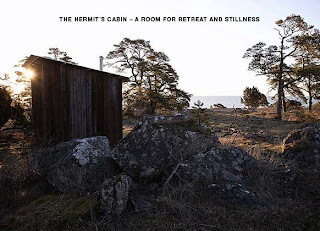 The Hermit’s Cabin raises the issue of the individual versus society, and of mankind’s fundamental need for solitude. It’s about our origins and our relation to nature from the perspective of the urban society. Therefore the cabin is filled with most of the things a person need rather than the religious notion of the aesthetic or the most basic. Here you can light a fire, eat, sleep, read, doze or quite simply do nothing.” The cabin comes fully equipped with bed, chair, table, wardrobe, cooker, coathangers and curtain rods. Arvesund are also very keen on reusing old Swedish timber in furniture production (there's a special Hermit's Cabin birdbox which I rather like too). Thanks to Jonathan Satchell from Hut for alerting me to Arvesund. 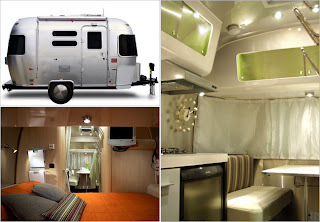 As mentioned in the New York Times this week, furniture specialists Design Within Reach and Airstream are working together on a trailer for mobile workers (“rock climbers, surfers, dot-com guys,” according to project head architect Christopher Deam). The idea is you'll be able to work anywhere with your mobile and wi-fi connection, quickly scramble an egg in the jazzy interior (upholstered in Paul Smith fabrics) then hit the road when the spirit moves you. If RVs are your thing, the always excellent MoCo Loco has a good roundup of some of the most interesting (including a couple suitable for homeworking on the go) here. * Jabba’ by I am associates. Image by Michael Trainor. 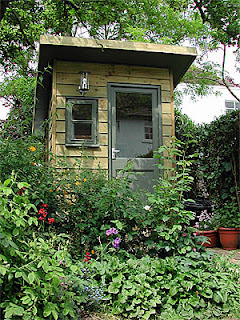 Not all garden offices are inhabited by a solitary shedworker. Here's a nice example of a garden studio for an established local business in Lacock, Wiltshire, which is a small self-contained structure discreetly built in mature landscaped gardens providing office space for three employees. Designed by ASA Architecture who also have planning permission for an interesting garden studio in Holland Park, London, in a grade II listed building. The office will be built of glass, timber and steel. There's a useful list of spots where writers can go to work at fictionwriting.about.com, mostly in the USA but with details on Hamburg too. Writers Room was established in the late 1970s to help city-based writers who need work space outside their home. Most of those listed have some kind of kitchen and communal spaces as well as desks and pencil sharpeners. There are various sheds around the country which have been converted into private pubs, but now everybody can buy an off the peg one thanks to the marvellous Can Sleep. It's, well, a beer can 2.20m in diameter, 3.75m high with a bed-loft. 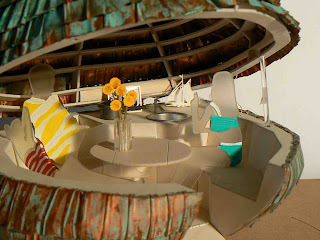 Half the roof can be opened (not with a ringpull) and the walls of the living room and the bed-loft are foiled. It all comes with IKEA furnishings and full electrics. The originals were produced two years ago for the Danmarks Smukkeste Festival. Another example of how garden offices and homes might eventually meld together is the Colani Rotor House from Luigi Colani and Hanse Haus. In a small area just 36 m², they've fitted in various areas (kitchen, living room, bathroom) using a rotating system, a kind of cross between George Bernard Shaw's writing hut and a lazy susan. 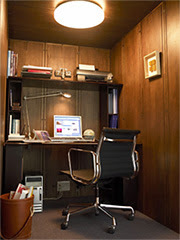 Dining room or home office? 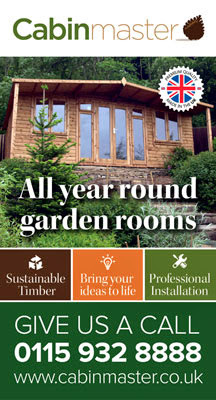 For any architects reading, there's an interesting new competition at www.lineofsite.info to design a garden shed. More details will be on their way soon. 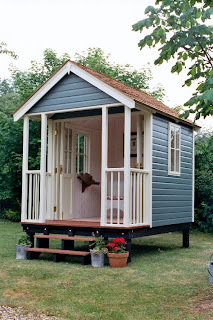 Just a reminder that if you are thinking of buying a garden office/shed you should check out Candy's Home Sweet Shed blog which I mentioned last week as building work is now underway and her photos give you a good idea of what's involved. She's also added contact details for various suppliers to her build e.g. floors, roof, etc, which is a great idea. Well, it will be soon with obvious implications for all those who work from home/shed. This piece in The Times by Rhys Blakely which looks at how London's Square Mile is now a gigantic wi-fi hotspot thanks to wireless broadband provider The Cloud. "The system has been designed to give 350,000 workers reliable internet access away from their offices via laptops, PDAs and smartphones," writes Blakely. "It echoes other schemes bent on making internet access ubiquitous, championed by groups such as Google in San Francisco. Access to what is being billed as the “densest, most comprehensive city-wide wi-fi network in Europe” will be free for the next month. After that, users will be charged £11.99 a month for “all you can eat” access to broadband speeds of up to 8MBs, or £4.50 for an hour." According to Richard Gray, science correspondent in the Daily Telegraph, The Institute of Directors is keen on flexible working and especially more homeworking (and by implication, shedworking) to help tackle global warming. According to Gray: "Miles Templeman, the institute's director-general, said offering employees greater flexibility would ease pressure on transport networks and cut rush-hour power demand - thereby reducing emissions. Mr Templeman urged ministers not to rush into policies that risked harming the economy, such as caps on emissions and carbon taxes." An interesting corrective to the survey results I posted earlier today from Mitel. There are still battles to be fought (and won) when it comes to homeworking according to new research from Mitel which suggests that over a third of managers feel that if allowed to work from home, staff will use working hours to carry out personal activities, such as taking a longer lunch. On the other side of the coin, two thirds of employees believe that by working from home they would actually take a more flexible approach to work, enabling them to be more productive (41%), and end up working longer hours (28%). The research reveals that when it comes to attitudes towards teleworking, nearly one in five (18%) employees would like the opportunity to work from home two days a week, and that over half (55%) believe it is an acceptable option for any level. Psychologist and employee productivity expert, Dr David Lewis, said: "Many businesses are finding potential recruits demanding flexible working as part of their package alongside salary and traditional benefits. Businesses must keep up with, and adapt to, ever evolving working practices if they want to continue recruiting and retaining the cream of the talent pool." Some eye candy to end the weekend, a lovely tree-ringed shed in Ann Arbor, Michigan (highlighted by Richard Banks at his fascinating and wideranging web site) designed by Pentagram. 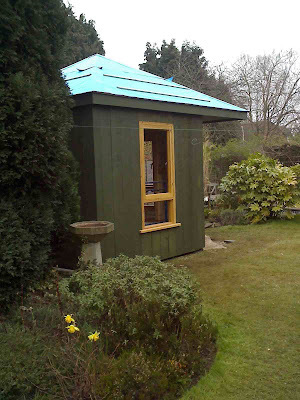 It's a marvellous piece of work in general, but the shed (a writer's studio) is really a beauty. An interesting piece - with some excellent pictures - in the Daily Telegraph about the shedlike pods used in the BBC series Castaway. They have now been relcoated to Cover Park Arts Centre on the Rosneath peninsular in Scotland and are now being used as homes for artists in residence. Timber-framed but with a zinc cladding and a fresh roof membrane, the interiors are decked out in Habitat decor and they are used from April to November by an international range of artists and writers. Sadly, architect Andy McAvoy who designed the pod specifically for the BBC show says there is no immediate plan for commercial production. More information from Cove Park Arts Centre. As reported in The Scotsman, BBC Scotland has opened its new headquarters, describing it as "a living, breathing, creative hub". And so naturally they've turned to shedworking to help them: the new multimillion pound offices also house two bright red sheds from B&Q which the BBC says are drop-in areas for staff to "have quiet and some ideas". I've no details about which model they've bought but my guess is probably something like the Apex Shiplap Double Door Workshop pictured here, which measures 10 x 16ft. 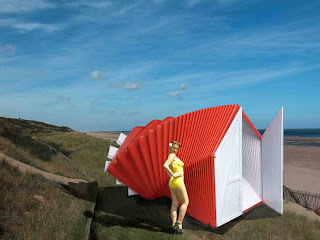 Bathing Beauties, an international exhibition of more than 100 models designed by artists and architects which re-imagine the British beach hut for the first time in 300 years, will be held during Architecture Week later this year. From June 15 until September 2, the designs (including the Onda House pictured) will be on display at The Hub, National Centre for Craft & Design, Sleaford, Lincolnshire. The Bathing Beauties exhibition evolved from the Bathing Beauties international competition which inspired 240 architects, artists and designers from 15 countries to compete for commissions to build their designs on the Lincolnshire coast. "The Beach Hut is one of the few building forms which has been seriously overlooked by contemporary architects the world over. They are perceived as a treasured feature of our coastal landscape, as quintessentially British as fish and chips and the knotted hanky, but in reality are usually little more than a painted shed," said Michael Trainor, Lead Artist & Project Curator. The designs are often pretty futuristic and owe little to traditional ideas of seaside architecture. Look out for wind turbines, saunas, camera obscuras, viewing platforms and space-ace materials. 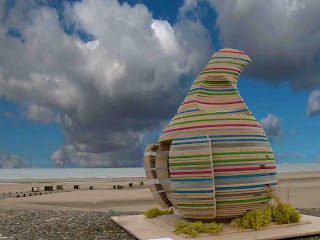 Although I hope there are a few sandcastles too and indeed the exhibition features a full-scale beach hut, Oyster Pleasance, designed by a team including architect Will Alsop. 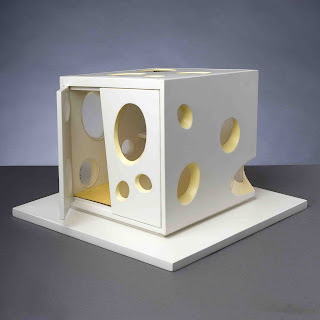 Nine of the models on display are in the process of being commissioned for full-scale construction in Summer 2007 along a 10 mile stretch of coast between Mablethorpe and Chapel St. Leonards on the Linconshire coast, UK. 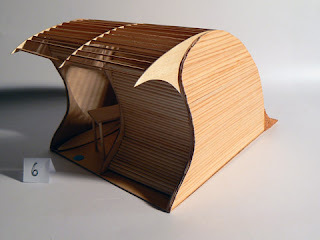 These innovative new beach huts will be available for daily hire from East Lindsey District Council. For more details go to the truly lovely Bathing Beauties web site here. 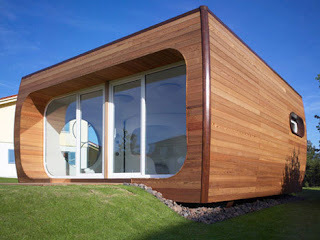 Another look into the future of shedworking with the micro compact home [m-ch] from architect Richard Horden. 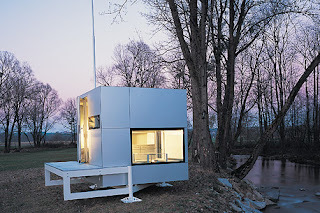 It's a lightweight compact building, a 2.6m cube, in which you can live as well as work. It has a timber frame structure with anodised aluminium external cladding, insulated with polyurethane and fitted with aluminium frame double glazed windows. A eco-friendly version is available powered by pv solar cells and a small wind generator mounted on the roof. Inside are two beds, shower and a kitchen. The design has various inspirations including a Japanese tea-house. For more information, go to the interesting site here. 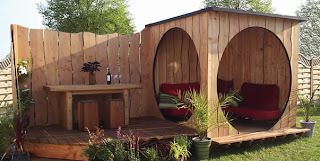 Home Sweet Shed is a new blog by journalist, artist and web designer Candy Gourlay which is charting the construction of her new garden office by Rooms Outdoor who are the first UK supplier I posted about on the site (in fact it was the first ever post on the site). It's early days yet - although there's plenty of information and imaging up there already - but certainly worth checking back on regularly over coming weeks. Wilco at the readersheds.co.uk blog mentioned Perth-based writer and musician Bob Davidson earlier this week and Bob's site is certainly worth a look. You can listen to - and indeed buy - his lovely song I'm Gonna Live In My Shed ("I don't know what goes through my head/Things in this world make me see red/But I don't want to spend all day in bed/I want to live in my shed."). 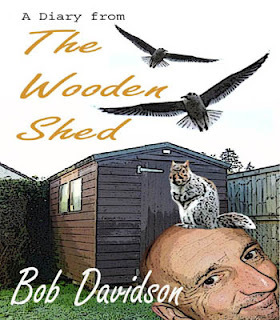 Bob has also written a book, A Diary From The Wooden Shed, in which he spends 60 days in his shed. Here's the blurb: "Look out, look out the Bird Flu will get you! One man’s attempt to escape the virus. But just what could possibly happen to anyone locked in a garden shed? Armed with only a Swiss Army Knife, some bananas, a supply of porridge and a clean pair of pants the hero embarks on a voyage of discovery. Self discovery and the discovery of other people and other things. All sorts of discoveries really, but not The Discovery Channel or that off-road vehicle, the Landrover Discovery which is too big, or that marvellous ship near the railway station in Dundee." Available from Amazon here. I'm enjoying the new Working from Home blog which is described as "a dumping ground for the day-to-day work I carry out at home, in order to keep a record of my progress. I will endeavour to make it interesting by including any events surrounding w.f.h. and any interesting snacks I make while waiting for downloads!" To be truthful, it's the snack element I'm particularly interested in, a subject close to the heart of many homeworkers. Here's a typical post, from April 18. "I had mackerel on toast in the hope that the omega 3 would kick in quick as my brain doesn't seem to be on top form today. I also had de-caf coffee in the hope that I don't cancel out the omega 3 with caffeine, although probably caffeine would help at this stage! I don't have any bananas left or I would have a couple and live in hope that would kick start my brain cells..." Well worth a look. Anybody who doesn't believe that working in a garden office can be lifechanging (as well as lifeaffirming) should read the marvellous Heidegger's Hut by Adam Sharr. 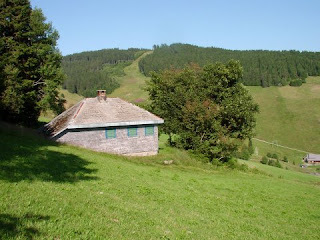 Sharr, a lecturer at the Welsh School of Architecture at Cardiff University, looks at how the German philosopher Martin Heidegger's hut near Todtnauberg in the Black Forest Mountians of Germany is absolutely central to his philosophy and writings. Built in the 1920s and measuring 6m x 7m (so it's not small), the book features plenty of original research including accounts of the hut by friends and family as well as lovely photographs of it, including Heidegger inside. Sharr suggests that the hut influenced some of Heidegger's key works including his essay 'Building Dwelling Thinking' and it was where he wrote much of his best work. "Heidegger is found to have sustained simultaneously quite different relationships with his hut and house," writes Sharr. "The former appears closely aligned with his writings’ emphasis on the philosophical and experiential potential of human situation. The latter was organised around domestic life, broadly ‘aesthetic’ in sensibility. There are many ways to interpret Heidegger's hut - as the site of heroic confrontation between philosopher and existence; as the petit bourgeois escape of a misguided romantic; as a place overshadowed by fascism; or as an entirely unremarkable little building. 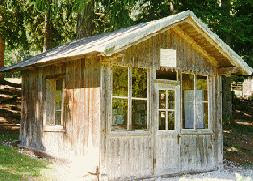 Heidegger's Hut does not argue for any one reading, but guides readers toward their own possible interpretations of the importance of 'die Hütte'." You can buy the book at Amazon here. The Soho/Solo project has had the delightful aim since 2003 of promoting the Atlantic regions of Europe as better places to live and work, encouraging rural sustainability and regeneration. One of the centres is in the South West of Ireland and the project aims to identify Small Office Home Office Workers(Soho Solos) in the region, to encourage others to relocate or return to the region, to promote Small Office Home Office Working and to offer support to these "new" entrepreneurs. Anne Robert runs the new and intriguingly-titled My Urban Garden Deco Guide which takes a broad look at everything a nicely turned-out urban garden could possibly desire. There's plenty here for the shedworker with an interest in design not to mention a whole, and growing, section on 'outdoor rooms'. It's written in an enthusiastic but not cringeworthy style too which is great. Anne also has licensed the site under a Creative Commons Attribution License which is highly laudable (if you're new to Creative Commons, then this post at Girl Friday is a good place to find out more). Well worth a regular look. 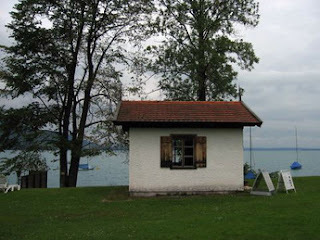 There's a nice piece about Gustav Mahler's composing hut (in fact his various composing huts) at the blog of The New Yorker's music Paul Ross. This is the one in Steinbach, above, with some lovely views of mountains and the lake, and also the one up in the Tyrol at Doblach. He wrote his second symphony and bits of the third at Steinbach and Das Lied von der Erde at Doblach. In the opening sequence of Ken Russell's film Mahler, one of Mahler's huts (the third, at Maiernigg) gets burnt to a crisp. Not the real one. Is working for home more stressful for women? That would seem to be the case according to a new study from Stockholm which is summed up nicely at the British Psychological Society Research Digest blog. It reports that researcher Terry Hartig looked at how working from home stops your house being a place of refuge from the world outside using workers at the Swedish National Energy Administration who had just become homeworkers. "Whereas male teleworkers actually reported experiencing less overlap between their work and private lives than the male employees at the office," says the blog, "the reverse was true for female teleworkers, for whom working at home had led to increased work/life overlap. This result bears on the possibility that women are more susceptible to the costs of telework." Interestingly, the study also suggested that having a separate working space had no effect on a work/life balance, though it's not clear whether they included garden offices/sheds in their research. Connecting Bristol will be holding a one-day Mobile & Flexible Working showcase on May 2 at the marvellously-titled The Passenger Shed, The British Empire & Commonwealth Museum, Bristol. There will be a range of local authority speakers on using ICT and wireless working to improve services and discussion on subjects such as 'How to get from pilot phase to strategic roll out of mobile and the development of flexible working strategies' and 'Meeting the Wireless Challenge'. You can find more details at their site here. 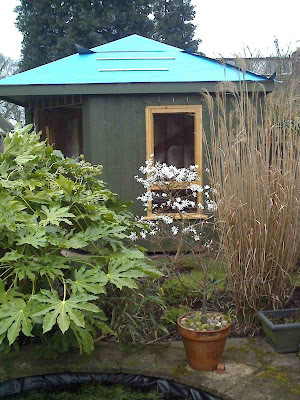 Now here's an interesting idea, a shed which you can work in without actually leaving your house. 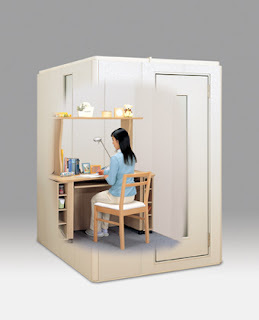 Pictured is Yamaha's Avitecs MyRoom, a soundproof wooden office pod/cubicle/shed, measuring 2.5sqm which you simply put up in a spare corner of your home. It comes in three colours and three types, the deluxe model having thicker walls and therefore better soundproofing (DR-35 as opposed to DR-30). It comes with a slit-window door, power points and a ventilation fan. For more details, click here but your Japanese had better not be too rusty. Go on. You know you want one. Available from Phoenix Trading. Suffolk-based Painted Pavilions have one of the widest and most attractive range of garden offices available as well as plenty of pictures on their web site of finished projects which conforms well with their mission statement that "We believe you would like something other than a dull shed-like studio or a mass manufactured utilitarian work place". There is a range of standard models as well as a genuine bespoke service, all put together inhouse where they have a fully equipped joinery. Timber is European Redwood from managed resources and for insulation they use a rigid extruded foam board with reflective foil surfaces, equivalent to an 8 inch thermalite block wall. On the roof are mineral shingles from Italy. My personal favourites (both pictured) are the Edwardian-style Langtry (not least because they suggest it can be put onto a rotating base a la George Bernard Shaw's writing hut) available on stilts with bi-fold doors, and the Gibbon which comes with four classical-style columns supporting an overhanging porch pediment and a slate roof. The company produces a range of contemporary constructions using cedar and iroko wood selected from sustainable sources and among other elements, uses glass wool recycled insulation. The company also recently received an achievement award for environmental performance from FORCE (Forum for Constructing Excellence). You can see the Garden Escape web site here. We're back on crossover territory with the Oswestry-based Outpost Pod which, while largely aimed at people who want an unusual summerhouse/eco hut, could also be used as an occasional shed office since weatherproof screens are included which zip open and clip neatly to the inside of the portholes. Each pod is made to order using locally sourced FSC timber from renewable woodlands - that means ever-popular Western Red Cedar cladding (oiled and protected against fungal and insect attack) with a roof of felted bitchumen-coated board with green roof option. Another option is their own Pod furniture including upholstered futon-type bench sofas. A nice article in the current issue (May) of Ideal Home magazine by Mair Edwards. She tells the story of her own shedbuild with InsideOut Buildings, quite a big one which also includes a kitchen and bathroom so that it can become a guest bedroom space when needed. Also namechecked (with pictures) are Forest Garden, Ceroko, Garden Escape, Homelodge, Hut, and Sanctuary. 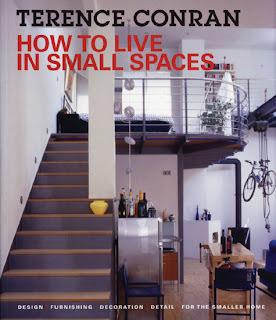 Terence Conran's latest book How to Live in Small Spaces is an interesting read and part of the increasing trend to make the most out of, well, small living spaces. As well as looking at domestic interiors, he also devotes several pages to shedworkers - apparently his son Tom is one - as well as a more general look at home office spaces. There are various nice photos, especially of the Sarah Wigglesworth shed project featured eleswhere on this site. 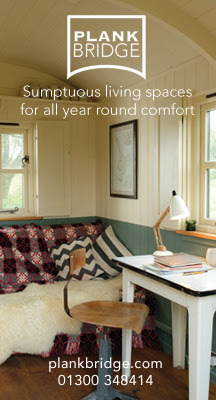 If you're interested in small space living, go to the specific about.com site here. 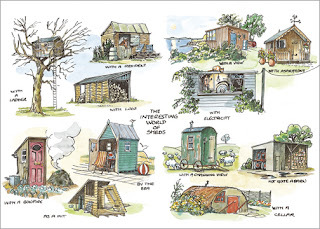 The official dates for National Shed Week have been announced by Wilco from the internationally famous readersheds.co.uk and will run in the first week in July, starting Monday July 2. 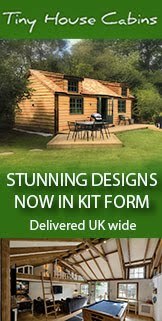 There will be a Shed of the Year competition and among the other categories will be a Garden Office of the Year award, sponsored by this blog and The Shed magazine. 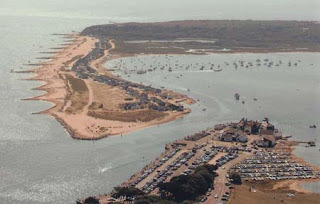 Following the piece here and in the last issue of The Shed on beach huts, Tim Baber has contacted me with information about the Mudeford Sandbank News, an online magazine (previously just 'old' media) which covers the Hengistbury Head, Mudeford Sandbank and Christchurch Harbour area in Dorset (pictured). It's one of the UK's premier locations for beach huts (as reported at the weekend, a hut there is currently up for sale at £160,000). Tim, whose family have several generations of experience of beach hut ownership, is editor of the magazine which provides information on the latest hut-related news as well as background history of huts in the area in the expansive archive section. For more information go to the site here. As reported on their own web site, members of the North West Flexible Working Group recently met the Prime Minister and expressed their views on how flexible working can be encouraged and supported across the region and the rest of the UK. In a private meeting with Tony Blair, hosted by Peter Connor, Chair of the Northwest Flexible Working Group and BT Regional Manager, members of the Group set out the aims and objectives of the Group and highlighted cases of flexible working good practice from across the region. Here is the latest update on homes for sale around the country which include garden offices on their particulars. Future 'For sale' posts will focus on individual properties. with power, light, telephone and broadband connection. 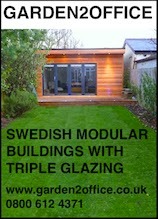 Garden office, double glazed windows, power, light, Telephone point and satellite dish. Studio/Office, (external measurement) 26' x 21'( 7.92m x 6.40m). Large brick built unit ideal for use as a office/ gym, studio etc. Concrete floor, double glazed windows and door, recess ceiling spotlights. Garden workshop/office, 24’ x 14’2”. Timber built office, a range of power points, cable point for broadband internet, fitted workbench and shelving, carpeted flooring. Fully insulated and panelled. Plus a lean-to bespoke shed features fitted shelving, light and power. An interesting idea at the alphavictim blog which discusses when the major American cities were founded and suggests the last one was Phoenix, more than 125 years ago. "Anyone who has driven through rural American knows there are some great, virtually deserted places where a major city could have thrived if only America's pattern of immigration and expansion had been different or a major deposit of precious metals had been located nearby. Nice climate, cheap land, pretty setting, lots of water, etc. Just no jobs, I guess. With so many virtual office workers who can live anywhere around these days, could they somehow get together and found a 21st century New York somewhere in rural America?" "So if you had a spare bedroom set up as an office, and part of the time it was used as a business facility and at other times as a place where your children did their homework, then you would be allowed to claim for the identifiable costs when it was being used as a business office. But beware - if the room has two desks one of which is used for business, and at the same time the other is used for non-business purposes, then tax relief could be denied! HMRC have also accepted that an estimated £2 per week is a reasonable cost for the business use of home facilities - this is now in line with the £2 a week that can be claimed by employees working at home." 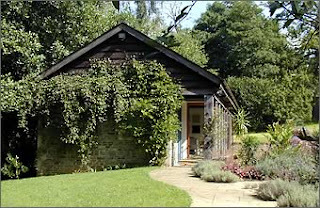 I asked Martin Little from Greenwood Wilson how this affected shedworkers in garden offices. "I see no reason why this shouldn't be treated in exactly the same way," he says. "Depending on the size, permanency and foundations there may be an opportunity to claim capital allowances on the shed, but I should imagine this would not apply with the 'larger' types of shed you would be using. This would apply mostly to smaller, moveable sheds." Kevin Holliday from Maison d'Etre Properties who produce the attractive and aptly-titled Garden Studio writes with details of their latest project in Nuneaton and these photos of a garden office under construction, nestling into the garden. Photo of the finished product on these pages next week. ACAS has just published published a new booklet - Flexible working and work-life balance - to help employers and employees understand how flexible working can benefit their workplace. The booklet looks at all kinds of flexible working (flexitime, shifts, homeworking, part-time working, though sadly not specifically shedworking), how employers can develop a good flexible working policy, updates on legal changes brought in by the Work and Families Act and a good Q&A section. Rita Donaghy, Chair of Acas said: "Flexible working really can add value to the workplace. Employees who work flexibly often have a greater sense of responsibility, ownership and control of their working life. It also makes good business sense. Customers often expect goods as and when they want them and flexible working can help meet these demands." Acas will be running a series of special short sessions on flexible working during April and May in England. You can download the booklet free as a pdf from their site here. David Aparicio at iscape is good at marketing his iscape garden offices and he seems to be the first to be using YouTube to extend his audience reach. The video below obviously sings the praises of the iscape range, but also talks about why a garden office is great for homeworking. Garden offices have had a good showing at recent Chelsea Flower Shows. 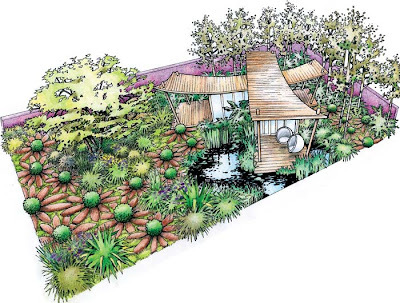 This year again there are a couple of Show Gardens with homeworking shed buildings, including Diarmuid Gavin's Westland Garden (pictured) sponsored by Westland Horticulture. 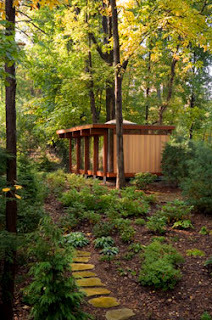 Gavin has included garden offices in his work before, the fine man, and this new garden contains a pavilion clad in western red cedar with two glass studio spaces, each with a deck overlooking a pond, for a homeworking couple. According to the RHS site: "This is an environment where the couple can express themselves artistically and intellectually, while being surrounded by a green haven in a woodland area." Recycled timber boards have been used for the floors in the buildings and rainwater is collected from the roof to water and top-up the pond. 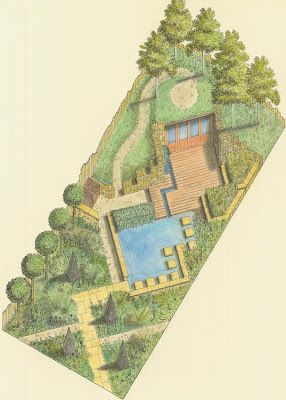 Also look out for The Marshalls Sustainability Garden designed by Scenic Blue to appeal to those with strong eco interests (e.g. solar-panelled sculptures). It also includes a cedar studio building built under an earth rubble mound - this is a green roof with a difference since it has foxgloves and mixed wildflowers rather than just sedum. You were right, Linus. 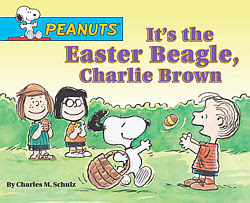 There really is an Easter Beagle. Back on Tuesday, half a stone heavier. I'm coming late to the game on this one as I was sent details about this on April Fool's Day and thought it a clever prefab joke, but since then The Observer and Sunday Times have both featured it as has Wilco over at readersheds.co.uk, so the joke is on me. Essentially, The Bothy Lodge Company - the baby of TreeHouse Company mogul John Harris - is providing hotels with very, very upmarket 'sheds' to sleep in. The concept has taken two years to develop and the first ones are already in place. Each Bothy (there are four designs) is built with superior 'Thermowood' which can be stained in a range of colours, Canadian Cedar Shingle roof tiles and solid copper facings - the idea is to be hardwearning but also to mingle in gently with hotels' grounds. Built in Scotland, they are then re-assembled onsite. Inside you've got underfloor heating, luxury bathrooms with Grohe showers, high insulation and a built in wardrobe and dressing table, as well as single or double beds. All are designed to four or five star specifications. 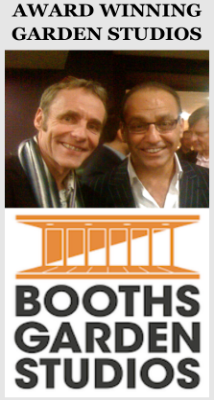 John Harris says: "The Bothy is a premium product, which will help hotels to differentiate their offer and command premium room rates. The purchase price is very favourable when you compare it to extending or refurbishing hotel accommodation and hotels can expect a return on their investment in less than three years." Rather like a common or garden garden office. In a way. Have a look around the site here. It's marvellous. Regular readers will know that after a good shed, the one thing we really must have here at The Shed HQ is a comfy chair. 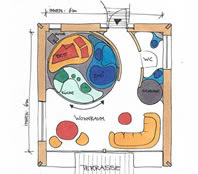 The PCE, pictured, claims to be a radical re-design of the personal workspace using a modular and scalable platform based to give a top notch ergonomic working environment. 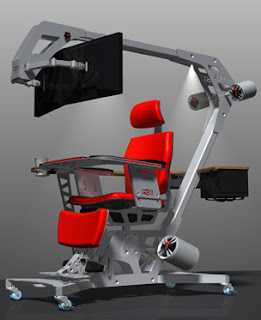 Indeed, they don't even call it a chair, they name it a 'command centre'. Once you've clambered aboard, your whole body is supported, knees and feet too, with shoulders and arms in line with the torso. For more information, indulge yourself here. Duncan White from the very eco-friendly Lindahl Lodge, specialists in bespoke timber buildings (including of course some very nice garden offices/sheds, pictured) tells me that Lindahl is about to embark on an exciting two storey treehouse in Hampshire which will take up most of April. Pictures will be posted on the portfolio page of their website when it's done. It is being built with children in mind as the result of a recent Save The Children charity auction and will be a playhouse among the branches with climbing wall, Zip Line, scramble net, etc. You can see their website here. If you work from home, then when you move house it's crucial that you find somewhere which has adequate homeworking space - or better still, a garden office/shed in situ. In the first of a new regular feature, we'll be featuring properties on the market around the country with a garden office. If you come across any in your local papers, please do email me here and please do mention the site if you contact any of the agents. 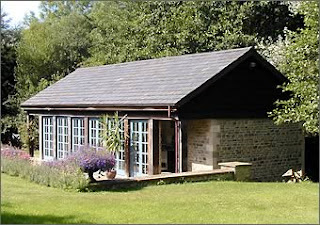 The garden studio is 10m x 3m. Charming cottage outbuilding with Crittal windows to the garden and Velux windows to the roof, pine and slate floor. Ideal private workspace. With panel windows to the side and panel door to the front aspect. This provides a sitting room/bedroom/office, kitchenette and shower room (incomplete). There is potential to create an additional first floor room subject to planning permission. 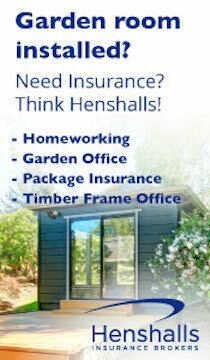 Garden office price hike on the way? I was interested to read Economics Editor David Smith's piece in the Sunday Times on price rises and consumer spending expectations since he took as his starting point his research into buying a garden office. "The other day I was looking for a shed for the garden. I say shed but what I had in mind was a palatial wooden building complete with double glazing and power supply for moments of contemplation," he writes. "Anyway, the point is that the salesman told me that I should get my order in quickly because the prices were about to go up by 10%. Being a canny kind of guy, especially when it comes to sheds, I checked. Sure enough, he was not spinning me a line." You can see the rest of the piece here. 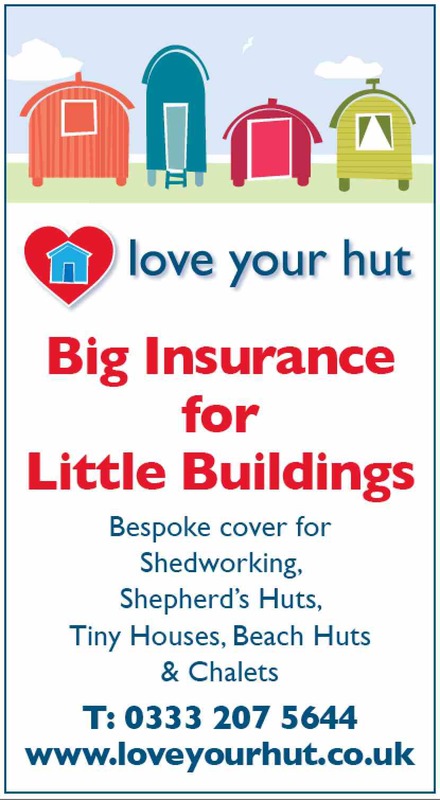 Hut Garden Offices - now based in Dorset near Wimborne - has launched its new web site which you can visit by clicking here. 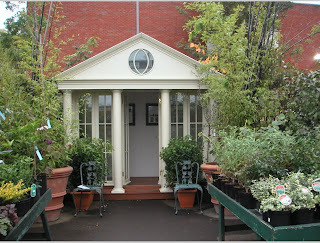 As before, the photo gallery is rather mouthwateringly done, and there is plenty of information about all aspects of construction and finish: this is one of the slickest garden office web sites around. Hut has also just completed a building for garden designer Ali Ward, co-presenter of all three series of Gardening Neighbours who has featured as an expert presenter on Gardeners' World, Housecall and Gardener of the Year. Look out for them too in the May issue of Ideal Home. If sheds are increasingly valued as work spaces than the prices they can command as places for relaxation also demonstrate a growing popularity, writes architectural historian Kathryn Ferry. It’s a question of the estate agent’s mantra ‘location, location, location’ but if your shed is by the sea, adopting the colourful guise of a beach hut, then its value will probably have risen substantially over the last decade. When I came up with the idea of writing a book about beach huts I imagined myself happily ensconced with pen and paper (electricity supplies being a rare luxury for hut occupants), words coming to me with the regularity of the lapping waves. After all, it works for the crime writer P D James who has penned many a successful novel in her hut at Southwold. Unfortunately, whilst I’ve been doing my research on the history of how wheeled bathing machines evolved into beach huts, the prices have continued to go up meaning my book needs to be a best-seller before I can even think about having my own hut! But perhaps it’s best for me to get on with my project inland because, having seen more than 20,000 huts around the English coast and having spoken to many dedicated ‘hutters’ I’ve realised that these fabulous bolt-holes come with many more in-built distractions than your average shed.There’s the sea for a start, with all its changing moods; the opportunities for people watching are plentiful and if you’re on the right stretch of coast the maritime comings-and-goings of ferrys, yachts and tankers can become oddly compelling. Beach huts are fantastic for families and their popularity owes much to childhood-holiday nostalgia; their very existence was a response to increasing leisure time from the late Victorian period onwards. 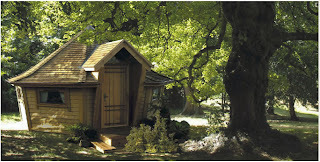 So I’ll finish my book in my inland out-house and, when I finally get it, I’ll keep my beach hut as my ‘time off’ shed. Kathryn Ferry’s book ‘Sheds on the Seashore: from bathing machines to beach huts’ will hopefully be out soon. For more information and to hire a hut go to www.beach-huts.com. (This article appears in the latest issue of The Shed magazine. For a free copy email me here. A request from Jenny Fuller who emails to say: "I am working for a Plymouth-based television company who are looking for people in the South West of England who have transformed their shed into a themed hideaway from the everyday world or have an unorthodox use for it. Lively talkers are especially welcome! It should preferably be something really unusual and would be a great opportunity to share their hard work. If anyone believes they are suitable or wanted to nominate someone else I can be contacted by email here. The closing date for submissions is Tuesday 10 April." At Business Week there's a piece on Warwick District Council's trial of WiMax wireless technology. The south of the area is planned to be WiMax enabled by the middle of next month to encourage flexible working patterns and homeworking. Under the heading 'Tech-savvy kids demand flexible hours' Silicon.com reports that the under-25s are getting keen on homeworking. Commenting on a Microsoft-commissioned report, Gemma Simpson writes: "Half of young employees reckon being able to choose when and where they work is more important than a fat pay cheque.Many workers now view the opportunity to work away from the office as a right rather than a privilege with more people wanting a good social life as well as a good career. The report also found 47 per cent already work outside the office - whether that's mobile-based, homeworking or in a wi-fi enabled coffee shop." In the latest Our Nation's Future lecture, Tony Blair concentrated on the role of work in the modern world. You can read a full transcript here. He talks a lot about work/life balance (with a decidedly puritan 'work is great' slant), flexible working and also homeworking, but he doesn't really back homeworking as a major step forward nor mention any way in which the government is encouraging people to become homeworkers, or indeed shedworkers. Click here to request your free copy. The Deluxe model, built from their Hampshire workshop, is individually handcrafted from weather treated pine, coloured to the client’s spec. It has two opening windows built into the side walls and a skylight above a secure locking door. Inside there’s plenty of room to work not to mention seating for 15 people on luxury fitted cushions around the central Ultimate Barbeque, with three fully adjustable rotating grill plates. 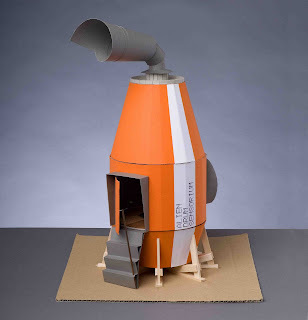 It has a static chimney hood to draw the smoke away from the fire and a roof finished in colourful felt roof tiles, not to mention a telescopic chimney. 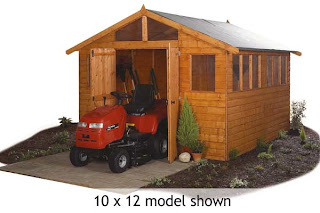 Normal optional extras on a garden office shed usually include extra windows or desks. 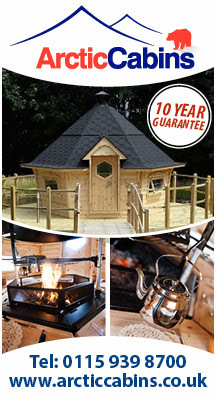 If you buy an Anglo Igloo you could also choose a Lazy Bones Spit Roaster, seats which can be converted into beds, and a fridge. 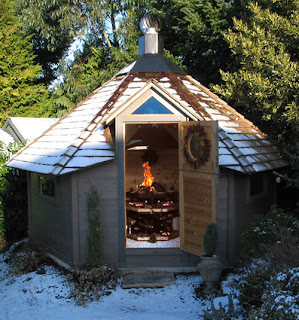 There is also an Anglo Inglet option, an annexe building with internal locking doors connecting to the Igloo as well as a door giving access to the garden. Plus benches which turn into a bed platform. Anglo Igloo also appeared on BBC's excellent Working Lunch programme recently and you can see them and find out more about their business here. A version of this article appears in the latest issue of The Shed.Email me here to receive a free pdf copy. * Weekend May 19/20 - Wise Work Weekend: a consumer-focused initiative to provide guidance and help to those people who would like to work smarter. * Monday May 21 - the transport impacts of smarter working. Further information about Work Wise UK can be found on their website. 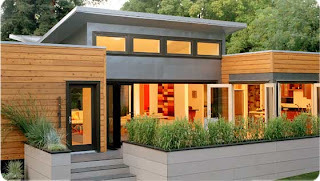 Michelle Kaufman is a big name in the world of green prefab building in the US. While none of her projects could be described as garden offices, her work does blur the boundaries of home and garden. For example, her Sunset Breezehouse (pictured) is built around a series of courtyards and private gardens for every major room. So while it's not exactly shedworking, it's maybe the next evolutionary step. You can find out all about her various interesting projects at her excellent and informative website here.